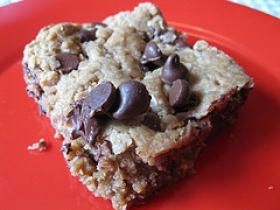 Have you made Caramel Oatmeal Bars? 2. 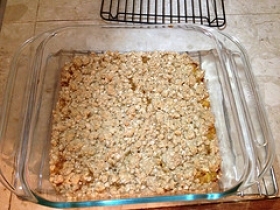 Line an 8- or 9-inch square baking pan with foil. 3. Lightly grease foil. 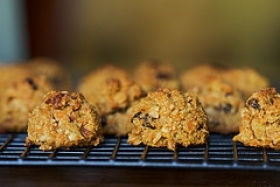 Mix oats, 1 cup flour and the sugar in a large bowl. 4. 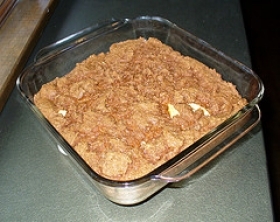 Add butter and cut in with pastry blender or 2 knives until mixture resembles coarse crumbs. 5. Press about half the mixture evenly over bottom of prepared pan to cover. 6. Bake 10 minutes or until top looks dry and tiny cracks appear. 7. Sprinkle with walnuts. 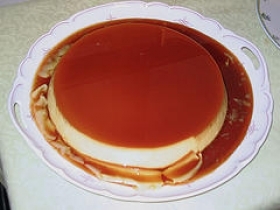 Stir caramel topping and remaining 3 tablespoons flour in a medium-size bowl until blended. 8. Pour over nuts. 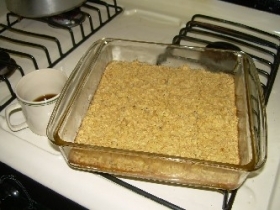 Sprinkle with remaining oat mixture. 9. Bake 20-25 minutes more until edges bubble slightly. 10. Cool in pan on wire rack. Then, to make cutting easier, refrigerate 1 hour or until cold. 11. Lift foil by ends onto cutting board. Cut in bars.